LAS Group and Qualitas are pushing ahead with plans for their One Wellington project located on a 2,400 sqm at St Kilda Junction. The mixed-used development comprises a mix of retail and residential apartments across two towers of 26 and 10 levels respectively. 47 apartments will be accommodated within the podium, 27 apartments in the East Tower and 126 in the West Tower, designed by K.P.D.O. Urban.com.au spoke to LAS Group Managing Director Les Smith who provided valuable insight into the development and the company's motivations for purchasing the site and reworking the endorsed scheme to produce One Wellington. Urban.com.au: What was the appeal of the One Wellington site for LAS Group? Les Smith: We’re always looking for great inner-city locations that are unique and special in a number of ways. When we found the site for One Wellington St Kilda, we went through an extensive research and design development phase, obsessing about every aspect of the project, from the site itself, to its historic and current day context and really, most importantly, how people could live there and use the space. So we had an idea of what we wanted to develop in this location, and this site provided the perfect place to do it. Because of its unique positioning, the sweeping park, bay and city views at One Wellington St Kilda will never be built out. 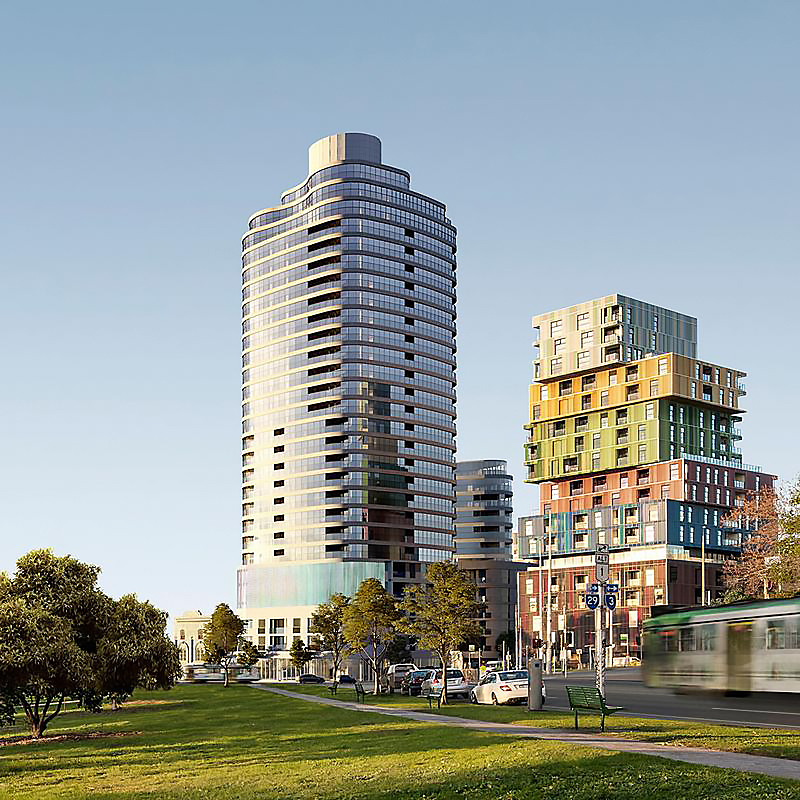 The site is surrounded by Melbourne’s most vibrant and lively neighbourhoods offering residents choice and connectivity. We wanted to embrace the ‘multifaceted’ nature of the site, which sits at the edges of St Kilda, St Kilda East, Albert Park, Prahran and Windsor communities, which are all very different, despite being so close to each another. We wanted to take that richness and extend it to the building itself to create something multifaceted, and suitable for a diverse group of residents. We talk to people on the home hunt all the time, and so many say how frustrating it is looking for an apartment that doesn’t feel mass produced; that it’s a struggle to find something more to their taste. So knowing that, and with the site we’d found, we started exploring other ways we could create real choice and flexibility in a home, including interiors that could be personalised, and amenities people wouldn’t necessarily have access to in a freestanding home. 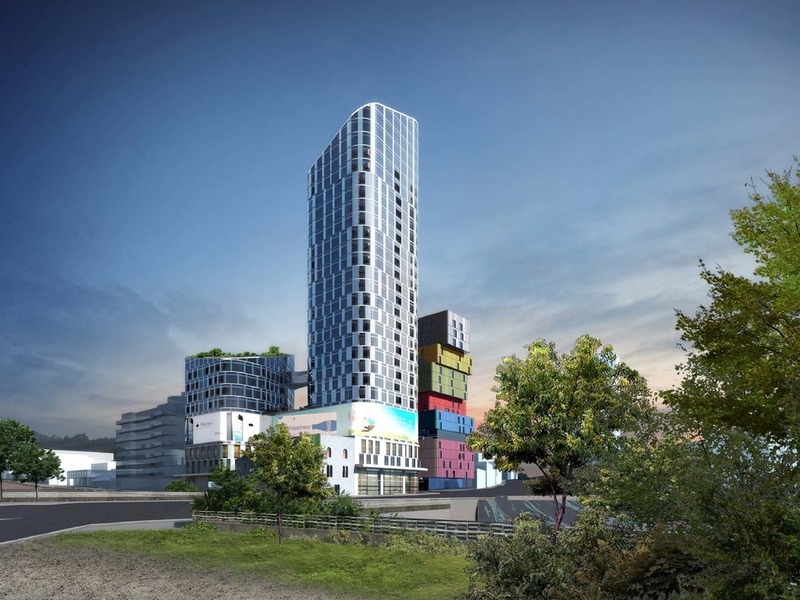 U: The site had a permit for a multi-storey residential development. Was this a major factor in the acquisition of the site? LS: It has some bearing on our decision, however the location was the real major factor. U: Rather than proceed with the endorsed scheme, LAS Group instead chose to engage K.P.D.O. who you have previously collaborated with on the Fawkner Residences. What was the driver behind this? LS: K.P.D.O. really understand what, from a design perspective, future residents of St Kilda want. But they also design spaces based on how the resident is going to feel, rather than designing based on trends only. It means their designs are more interesting, often unexpected, and always thoroughly considered. K.P.D.O. consider the location and neighbourhoods, and design spaces that compliment those inside and out. At One Wellington, they have created an elegant building that will sit beautifully in a high-profile site, and they’ve also created intelligent, beautiful internal spaces for residents to enjoy. U: What was your brief to K.P.D.O? LS: We find specific sites that we like and we spend a lot of time engaging with our design teams to get the right outcome not just for future residences, but also the local community. St Kilda Junction is a prominent site that’s very visible in the skyline so we spent a lot of time thinking about how we build it externally. We wanted to create a building that would have a conversation with its neighbour, The ICON, rather than compete with it. Putting a brightly coloured building would have been too loud, so we wanted to put something that was also colourful, but in a more subtle way. U: What are some of the challenges associated with developing on a site bordered by busy vehicular thoroughfares? LS: There were no real issues. Nelson Street provides great access – it is the back door of the development with car park entry. As a developer, I’d rather be constructing here over some of the constrained sites in other CBD or inner-city locations. U: Who is the target market for One Wellington? LS: One Wellington St Kilda is for home buyers who want to reconnect with and immerse themselves in the vibrancy of inner city living. It ticks all the boxes for home buyers who value choice, personalisation and connectivity. That’s why we’ve designed the building and interiors in a way that purchasers can really personalise their new home to their personality, lifestyle, style and taste. Not only can residents personalise the interiors of their apartments, the building’s flexible design principle makes it easy to combine apartments across most levels of the building, providing even more choice. We want home buyers to become far more involved in the design of their apartments and buying a home at One Wellington means purchasers will have access to an incredible, award-winning design team at K.P.D.O. that most people don’t have the funds to access. We want people to come and tell us what they want, not ask what we have. If you’re a family with three teenagers, we can give you a four-bedroom plan with two living areas. If you’re a couple who likes to entertain, we can give you indulgent living spaces. We understand that many first home buyers are entering the market much later and so they have established careers and a bigger budget than younger first home buyers. They are also more discerning in their tastes and want to express their personality, style and taste in their home. We are also seeing downsizers who want to reconnect with the vibrancy of St Kilda. A big drawcard for them is the expansive Albert Park Lake across the road as well as the incredible park, bay and city views that can never be built out. One Wellington boasts the best apartment views in Melbourne. U: The site isn't short on amenity for residents as it's located in close proximity to Albert Park, Fitzroy Street and the St Kilda foreshore, while also being a short tram ride away from the Melbourne CBD. Do you expect this will be a big appeal to prospective buyers? LS: Yes. More and more people are taking advantage of the lifestyle benefits that come with inner city apartment living. We have seen an increasing popularity of apartment living, not just for young couples, professionals and families, but also the downsizers so there is a greater demand for residences that are functional, practical, sustainable and truly liveable. Aside from the connected, multifaceted location, and access to local amenities and facilities like the pool, gym, cinema and concierge, an apartment at One Wellington is going to feel like a home, not just a carbon copy of every other apartment in the building. Of course it makes it challenging for us to offer so much choice in an apartment – but we genuinely think it’s the right thing to do for people buying into a community like this. Personalisation is beyond a trend – it is going to become instrumental to all residential apartments. We’ve really thought about that aspect of One Wellington, making sure the connection between home and the surrounding neighbourhoods would be seamless. It might sound trite, but we’ve thought about the liveability of each space, each room, and each individual, whether you’re driving, walking or cycling to and from home. It’s the considered, small moments that matter – we’re thinking of liveability as the new luxury. Check out Urban.com.au tomorrow for our interview with K.P.D.O Director and Architect Stephen Javens. For more information visit www.onewellington.com or click on the One Wellington Project Page.